WARNING - This post contains some R rated content. Well actually with what I've seen at the movies lately this may be considered PG-13 but you have been warned! For those of you who are Seinfeld fans you may remember and episode where Elaine was upset because her chosen contraceptive method - the sponge - was being taken off the market. She went to the store and bought everything they had left. However, it had an unintended consequence. She found that she was having difficulty dating guys because she was now scrutinizing them so much more carefully as she was deciding if they were "sponge worthy" before she would agree to go out with them. Not many guys were found worth the dwindling supply. Why am I discussing this on a knitting blog? 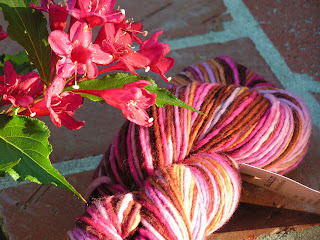 Well I was thinking the other day of some gorgeous yarn that I have purchased with no intended project in mind. Despite repeated promises to myself that I will ONLY buy yarn if I already know what I'm going to make with it, I continue to buy yarn simply due to it's beauty figuring I'll decide what to make later. But the problem is I love the yarn so much and it is so beautiful it is often hard to find the right pattern. Is that scarf yarn worthy? What about those gloves? A hat? A bag? A pattern that you loved and couldn't wait to make is often "not good enough" for the gorgeous yarn. So the yarn sits in the bins being admired from time to time but yet to be made in to something wonderful. I guess it will just have to wait until the right pattern comes along and sweeps it off it's skein. Sorry if I have offended anyone but at least I'm not talking about the "master of my domain" episode! Funny comparison.. but I can totally relate. There is a level of finality in making a decision and casting on. Unlike Elaine, however, one can always FROG a bad cast on decision!! Not much she can do mid-way to change her mind! No offense --- and some yarns simply aren't "stashworthy. . ."
Did you ever receive my SP-thank-you package? Well, if you stop buying yarn, then you'll be the mistress of your domain ;}. But I'd miss you....btw - the hiya hiyas shipped yesterday (they should be in Monday or Wed) and the addis not until next week.